In a significant push that has the potential to boost availability of more affordable transport fuels, better use of agricultural residue, cattle dung and municipal solid waste as well as to provide an additional revenue source to farmers, Shri Dharmendra Pradhan, Union Minister of Petroleum and Natural Gas, Skill Development & Entrepreneurship,has kicked-off an innovative initiative with PSU Oil Marketing Companies (OMCs, that is, IOC, BPC and HPC) inviting Expression of Interest (EoI) from potential entrepreneurs to set up Compressed Bio-Gas (CBG) production plants and make available CBG in the market for use in automotive fuels. Launched on the penultimate day of the ongoing Swachhta Hi Seva fortnight, a mass movement to fulfill Mahatma Gandhi's vision of a Clean India, this initiative holds great promise for efficient municipal solid waste management and in tackling the problem of polluted urban air due to farm stubble-burning and carbon emissions. 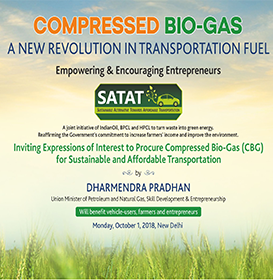 Use of Compressed Bio-Gas (CBG) will also help bring down dependency on crude oil imports and in realising the Prime Minister’s vision of enhancing farmers’ income, rural employment and entrepreneurship. What is Compressed Bio-Gas (CBG)? Bio-gas is produced naturally (through a process of anaerobic decomposition) from waste / bio-mass sources like agriculture residue, cattle dung, sugarcane press mud, municipal solid waste, sewage treatment plant waste, etc. After purification, it is compressed and called CBG, which has high methane content. Further, Compressed Bio-Gas is exactly similar to the commercially available natural gas in its composition and energy potential. With similar calorific value and other properties similar to CNG, Compressed Bio-Gas can be used as an alternative, renewable automotive fuel. Given the abundance of biomass in the country, Compressed Bio-Gas has the potential to replace CNG in automotive, industrial and commercial uses in the coming years. Compressed Bio-Gas plants are proposed to be set up mainly through independent entrepreneurs. CBG produced at these plants will be transported through cascades or through pipelines to the fuel station networks of Oil Marketing Companies (OMCs) for marketing as a green transport fuel alternative. The 1,500-strong CNG stations network in the country currently serves about 32 lakh gas-based vehicles. It is planned to roll out 5,000 Compressed Bio-Gas plants across India in a phased manner in the next 4 years. Compressed Bio-Gas can be produced from various bio-mass/waste sources, including agricultural residue, municipal solid waste, sugarcane press mud, distillery spent wash, cattle dung and sewage treatment plant waste. The other waste streams, that is, rotten potatoes from cold storages, rotten vegetables, dairy plants, chicken/poultry litter, food waste, horticulture waste, forestry residues and treated organic waste from industrial effluent treatment plants (ETPs) can be used to generate biogas. 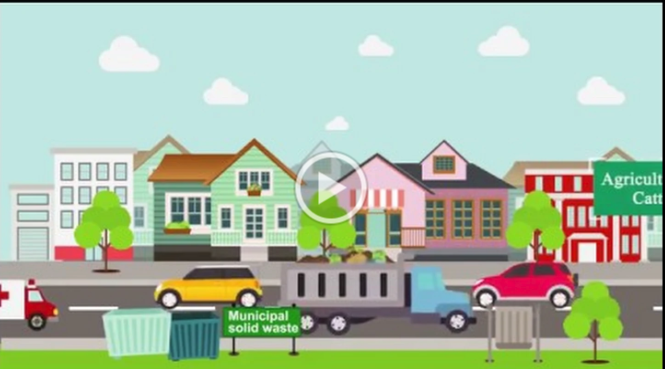 What is considered as waste today can be transformed into energy in the near future! Every bit of biomass can be used to produce bio-gas and bio-manure. This will go a long way in making India energy self-reliant, help combat global warming and mitigate climate change. The Government of India is committed to transforming India into Sasya-Syamala Bharat, a Sujala-Suphala Bharat.